We fail so we can learn. If you never failed, you would never learn. You’d just be perfect in every way … which sounds super boring to me. How will it help you succeed in the future? How will you do things differently next time? Understanding lessons can help us see that our time and efforts aren’t wasted — we’ve come out this a smarter, more able human than before. There are a lot of gatekeepers in life who can help us achieve what we want or hold us back. They could be the person who’s interviewing you for your dream job. It might be the publishers you’re sending your novel to. It could even be as simple as the friends of the guy or girl you really like. Here’s the thing: Deep down, they don’t want you to fail. But they can’t let everyone through, so they also want the best. Each time they reject you, you can look at it one way and quit. Or you can look at it as you’re not quite there yet, but if you keep at it, if you use those lessons to keep building, you will be. Pretty much every famous person you know of has failed at some point in their career. Failing is disheartening. So for motivation to keep going, look to these people who came and failed before you. The Chicken Soup for the Soul series was rejected 140 times before being published. Even Dr. Seuss and the Harry Potter series were rejected. The founder of the Honda car company had his factories destroyed both by war and an earthquake. If these people had faced failure a few times and given up, they would’ve never found their massive success. Use stories like this as motivation. Sometimes we think we should succeed almost immediately. Maybe you think your new business will be an overnight success, or you’re going to master that new skill almost instantly. And then it turns out, success is hard. And maybe we quit. Or maybe we keep on going like the people above in No. 3. So check your expectations. Unmet expectations can actually cause us distress (they affect the chemicals in our brain). Bamboo seems like it takes a long time to grow. For the first five years, you don’t really see much happening. Just a tiny shoot. For five years. What we don’t see is what’s happening underground. Its roots are pushing through the dirt, growing in complexity — setting the foundation. And then, its growth explodes and the tree can rise by up to a meter a day. Success is the same way. Look at your failures as setting the foundation. Take the long-term view and grow bamboo. What goes through your mind when you fail? What you tell yourself can have a massive impact. If you fail and think, “I’m a failure,” there’s a problem. That statement implies that you are currently a failure, have always been a failure and will continue to be a failure. It can get tough especially when you have multiple failures in a row. But look at each one as a specific, non-permanent event. Just changing your self-talk around can have a massive impact on your success and perseverance. If you’re having difficulty regaining your confidence and bouncing back, grab a pen and some paper. If you’ve failed, it can be easy to become too focused on the negative and not see the positive (especially if it’s been failure after failure). If this happens to you, it’s ok — our brains have a negativity bias, so it’s just the way we work. When you feel like you’re starting to become overwhelmed by failure and having a hard time continuing , write down every success you’ve had you can think of. Focus on the tiny successes. You can even keep a daily journal of them to help you keep going. Our brains are funny things, and they respond to threats that sometimes aren’t there. Some of those threats are things that make us look foolish or lesser in the eyes of others. We don’t want to fail. But failure is not a reflection of who you are. Your reaction to failure is. It’s your call whether to pick yourself up or not. If anyone judges you based on your failures, that’s their problem, not yours. If you keep trying the same thing over and over and it’s not working, it’s time to take another look at it. Are there people who can help you? There’s a saying that doing the same thing over and over and expecting different results is the definition of insanity. It’s not, but it is kind of stupid. Failure might be telling you something more. Here’s the thing. I mentioned people who kept on going and going, but sometimes the right move is to quit. Seth Godin’s book The Dip is all about when to quit and when to keep going. It’s just looking at when quitting is the right thing to do. I used to teach Salsa dancing, and I gave it up. I kept trying to get new students and turn it into a full-time practice, but it wasn’t working. Were there other (probably more effective) approaches I could’ve learned and tried? Sure. When it came down to it, and I got really honest, my heart wasn’t in it. I wanted to be helping people in a different way. So I quit, and was immediately happier as a result. Stick with it when you’re growing bamboo. Quit when the soil’s no good and you need to plant elsewhere. And it’s okay to grieve a loss. So if you fail, especially at something you’re really wrapped up in, give yourself time to mourn it. How many days do you need? One day, maybe three or more for a larger failure? Give yourself time to get over it. But the key is to set a time limit. And once it’s set, commit to jumping back on the horse. 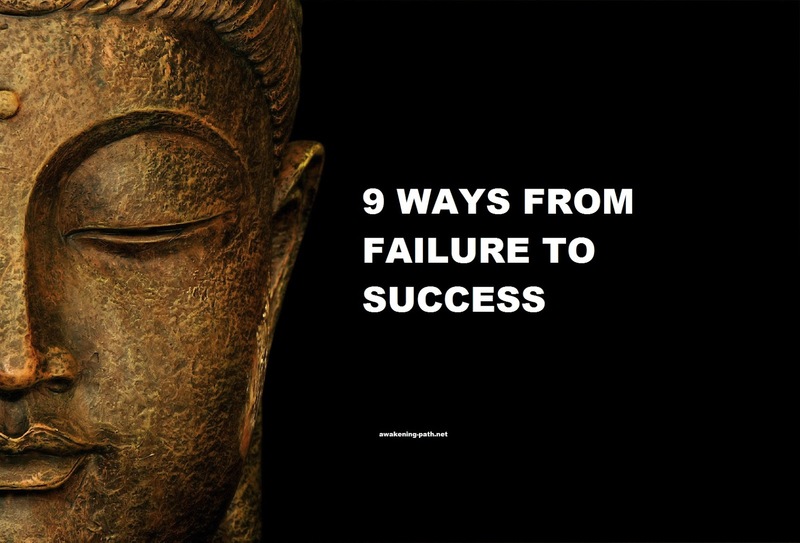 What this does is reframe how you feel toward failure — it makes your feelingsyour choice. In the end, it might not seem like it, but failure is not your enemy. It’s your mentor. It might be a mentor who you don’t want to see, but when they show up, it’s not to hold you back, but help you along. Your success is born out of the flames of failure. Embrace it and move forward.